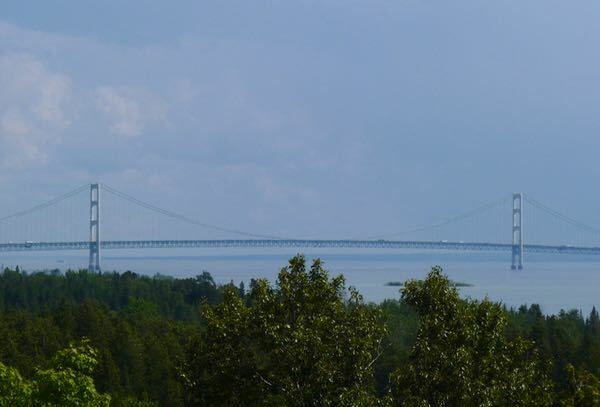 Here are a few scenes from the Michigan Upper Peninsula. Much of the time it was cloudy and wet. Plus a good vantage point for a decent photo was often hard to find. 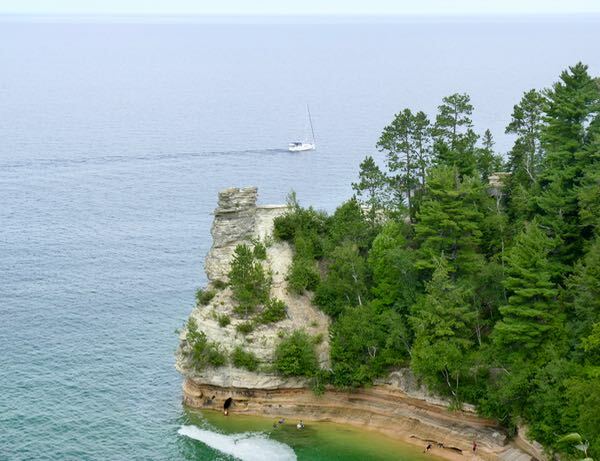 Within the Pictured Rocks National Lakeshore was Miners Castle rock formation, on the edge of Lake Superior, and just a couple of miles from Miners Falls. A slide has changed the shape in recent years. 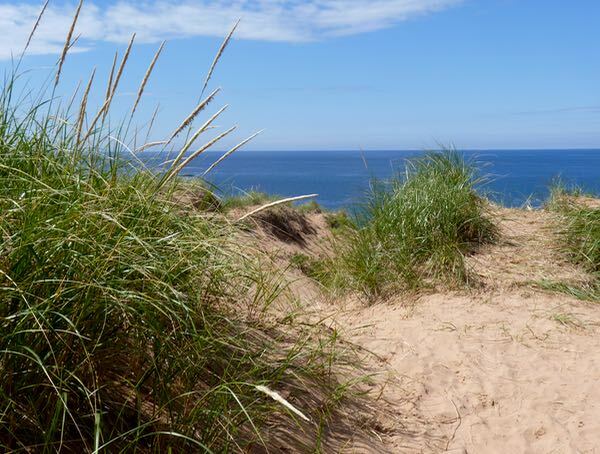 A one mile hike went out to the Grand Sable Dunes, where 5 square miles of sand dunes stretch along Lake Superior, with sand banks reaching 300ft high. My legs were reminded about hiking in soft sand; so, I didn’t wander around very far. 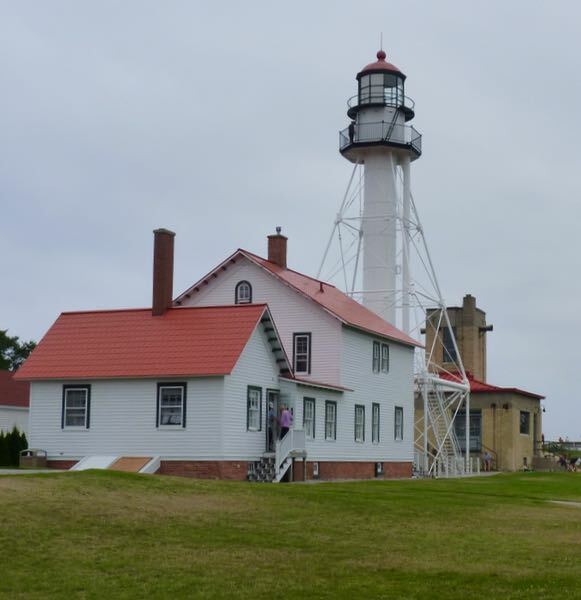 The Whitefish Point Lighthouse wasn’t all that impressive, as lights go. However, the area it protected was known for the most shipwrecks on the lakes. A testament to that was the Great Lakes Shipwreck Museum on site. Mackinaw Bridge links the Upper and Lower Peninsulas of Michigan. I considered taking the ferry over to Mackinac Island. However, it was raining and I couldn’t convince myself there was anything over there that I wanted to see. 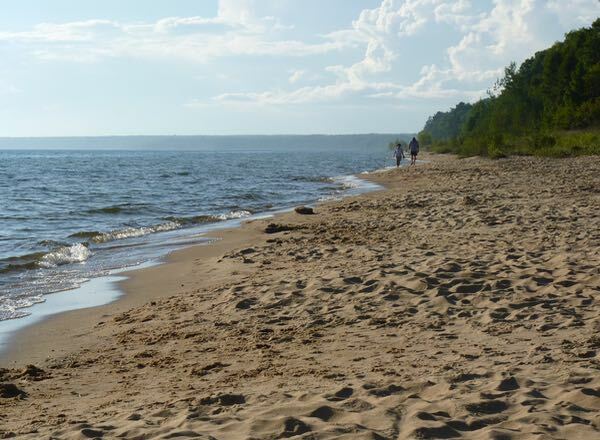 This beach on Lake Michigan was next to the campground I stayed at. A nice couple unknowingly posed for the shot. I’m not able to hike as far as I once did; so, perhaps I missed seeing some marvelous places on the UP. Note: This visit took place in August. Loved all of your last few posts, haven’t been responding because you pretty well said it all. Have to say that my Air Force Reserve unit did our “summer camp” at Alpena Michigan. We had “war games” I wrote details for our units newspaper about Lower Michigan being at “war”with Upper Michigan. The local press picked it up and ran with it. They used my stories in the local papers. Even had TV news coverage. That’s how exciting it is living there. A made up war was big news! Very interesting story about your time in the UP. It rings true today too; based on my experiences with the locals. Eh?! I agree with your opinion about the UP. It did however provide reasonable temps during August; along with high humidity and mosquitos. I much prefer the southwest, and will return there soon.